This tour operates daily from May to October or Mondays and Fridays from the last week of April. Coaches depart from Central Munich between 8.00 and 8.30, exact time will be confirmed in your booking. Visit during the summer months for a better chance of clear skies and panoramic views. Or, visit in May for the chance to see snow on the mountains. 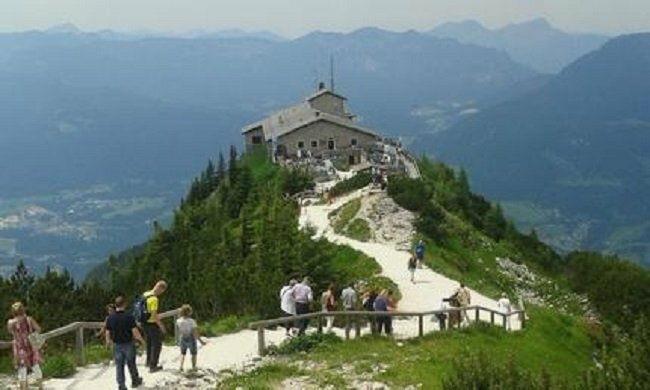 We are comparing Berchtesgaden and Eagle's Nest Day Tour from Munich Prices from leading ticket suppliers and Try to find you Cheap tickets prices on the market. Leave the Bavarian Capital behind you and journey to one of the finest spots in the Berchtesgaden mountain range. This tour is a unique combination of sightseeing, adventure and history. With an onboard English-speaking guide, you will learn about the region, the part it played during the Second World War and how Mount Kehlstein became the host of one of the last remaining Nazi buildings. Your experienced driver will take you to the base of the famous elevator, built into a natural tunnel inside the rock this elevator is a work of engineering genius which will take you 120 metres up to an open mountaintop. The building known as Eagles Nest was presented to Adolf Hitler in 1939 and despite heavy bombing during WWII most of the site remains intact, with the original fireplace plaque still hanging on the wall and genuine Allied forces graffiti marking the walls. This is a convenient tour for people interested in history and wanting to visit an authentic Nazi bunker while enjoying panoramic views of the Bavarian Alps. This is a great option for individuals, small groups, and those who would like to explore Southern Germany without taking private transport. Your Experience With Berchtesgaden and Eagle's Nest Day Tour from Munich? Board a comfortable air-conditioned coach and travel with a top-rated local company from the Centre of Munich to the town of Berchtesgaden. Enjoy breath-taking views of the Bavarian Alps as you drive on a twisting mountain road the entrance for Eagles Nest. Defy gravity in an early 20th-century elevator to reach the former holiday retreat of notorious Nazi Leader, Adolf Hitler. Have the option to explore the surrounding area or take a tour of the Lower Rooms. Take advantage of free time in Berchtesgaden, to shop for souvenirs, taste local foods, or visit the Documentation Centre. Return to Munich around 6.30 pm. What Berchtesgaden and Eagle's Nest Day Tour from Munich Includes? Full-day return transport from Central Munich by air-conditioned coach. Central Munich – drive to the entrance for Eagles Nest – Opportunity to ride the elevator and take a tour of the site – free time in Berchtesgaden – return to Central Munich. Check the weather in advance of booking your trip and aim to visit Eagle's Nest on a clear day, if you choose to visit when there is rain or fog you will miss out on fantastic views. Travelers Reviews about Berchtesgaden and Eagle's Nest Day Tour from Munich? Travellers have given the Berchtesgaden and Eagles Nest day-trip from Munich a 4.5-star rating on TripAdvisor, Get Your Guide, and Viator. The tour is run by Greylines and Pure Bavaria Tours, both of these companies have excellent customer feedback. Comments are very positive regarding the tour guides saying that they provide valuable information about the region. Reviews say that the views from Eagles Nest are spectacular and that the Documentation Centre is well worth a visit. E-tickets or printed tickets will be accepted. Tickets will be send the provided email address. Cancellation policies depend on your tour supplier. Tickets purchased from Viator are partially refundable from 48 hours to 6 days in advance and fully refundable up to 7 days in advance. Get your Guide will issue full refunds up to 24 hours in advance. Tour guide at Eagles Nest and entrance fees are not included in the ticket price. For days when there is heavy snow or ice the tour will visit the Salt Mines instead of Eagles Nest (Viator). Hotel collection is only available for travellers who booked through Get Your Guide. Meeting Point: Outside the Karstadt Department Store, this is located opposite the Munich Central Station on Hauptbahnhof.